It can also cause serious disabilities! 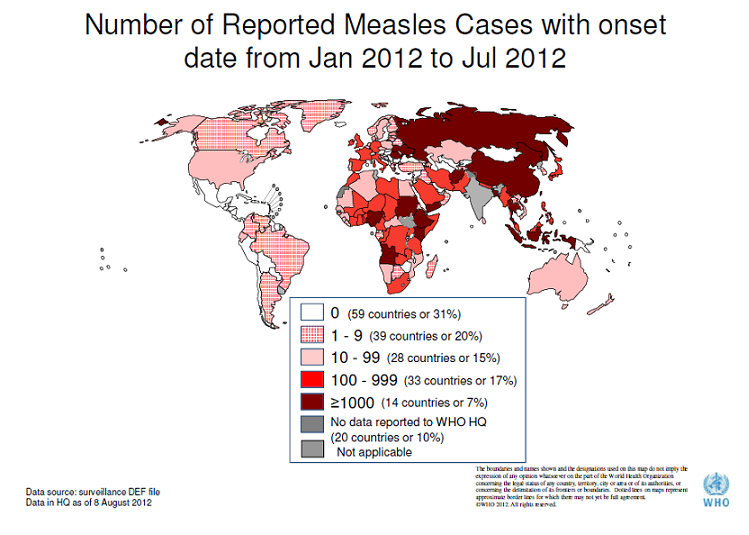 Measles is still a major cause of death and dis­abil­i­ty, espe­cial­ly in Africa. Measles is a seri­ous dis­ease because the measles virus infects the white blood cells that are sup­posed to kill germs. Instead of killing the measles virus, many white blood cells end up mak­ing more copies of the virus. As a result, the measles infec­tion dam­ages the immune sys­tem. In fact, the measles virus was the first viral infec­tion that was known to sup­press the immune sys­tem. Most of the deaths from measles result from sec­ondary infec­tions, such as pneu­mo­nia. How­ev­er, the measles virus itself can cause death. Like HIV, measles attacks the immune sys­tem. The dam­age can last for years! Measles is par­tic­u­lar­ly dead­ly in poor coun­tries because many chil­dren are mal­nour­ished and have oth­er health prob­lems, such as malar­ia or HIV infec­tion. Improve­ments in gen­er­al med­ical care, such as the intro­duc­tion of antibi­otics, has decreased the death rate among measles patients. Yet even with the best of mod­ern med­ical care, measles still does kill a small per­cent­age of the peo­ple it infects. It can also cause per­ma­nent dis­abil­i­ties, such as blind­ness. Here is a video about a young woman who devel­oped seri­ous men­tal dis­abil­i­ties as a result of measles encephali­tis. She had not been vac­ci­nat­ed against measles because of a minor skin con­di­tion. Here is a sto­ry about an even more seri­ous com­pli­ca­tion of measles infec­tion: sub­aute scle­ros­ing panen­cephali­tis (SSPE). It occurs in chil­dren who catch the measles when they are very young, often too young to be vac­ci­nat­ed. They seem to recov­er from the measles, and then they seem per­fect­ly healthy for years. Even­tu­al­ly, how­ev­er, the chron­ic measles virus infec­tion caus­es pro­gres­sive dam­age to the brain and ulti­mate­ly death. Most measles cas­es occur in poor coun­tries. How­ev­er, there are also a few cas­es per year in the wealthy coun­tries, main­ly because of out­breaks tied to import­ed cas­es. The World Health Organization’s strate­gic plan to erad­i­cate measles and rubel­la calls for high lev­els of vac­ci­na­tion, along with efforts to con­tain out­breaks. 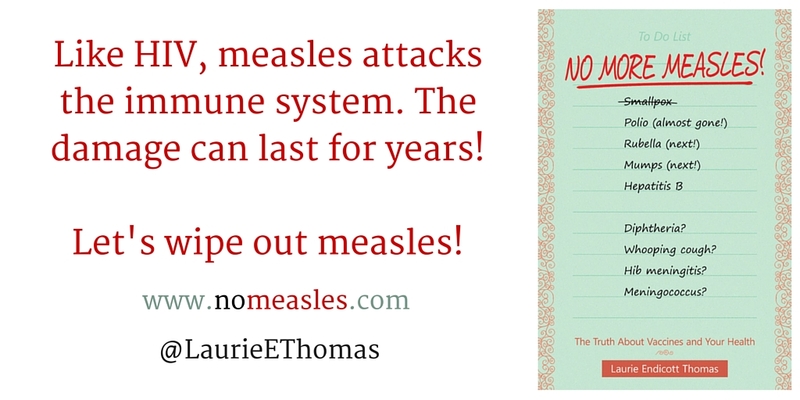 The measles vac­cine is a “live” vac­cine. As such, it has nev­er con­tained the mer­cury-con­tain­ing preser­v­a­tive thiom­er­sal. The measles vac­cine is gen­er­al­ly giv­en in com­bi­na­tion with the vac­cine for mumps and the vac­cine for rubel­la. There is no rea­son to give these vac­cines sep­a­rate­ly. Giv­ing the vac­cines as sep­a­rate injec­tions sim­ply means more injec­tions for the child and more chance that one of the vac­cines will be missed. 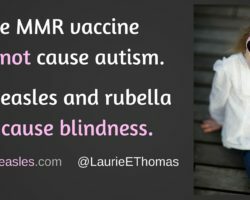 Because the measles virus is a “live” vac­cine, it can­not be giv­en to some peo­ple, includ­ing chil­dren with a sup­pressed immune sys­tem. Those indi­vid­u­als depend on the herd immu­ni­ty that results from prac­ti­cal­ly every­one else being vac­ci­nat­ed. Once measles has been wiped out through vac­ci­na­tion, we will no longer need to vac­ci­nate any­one against it. For more infor­ma­tion, vis­it the Web site of the Measles and Rubel­la Ini­tia­tive.